It is often new developments in technology that give rise to improvements in efficiency and environmental sustainability. Sometimes, however, the biggest innovations come from simply looking at old materials with new eyes. Case in point is Thermafleece – a patented sheep’s wool insulation material for buildings. People have know for thousands of years that sheep’s wool has excellent insulation qualities. We’ve been making garments out of wool for centuries, so why has no one thought to use sheep’s wool in buildings until now? Given that the standard insulation choice is toxic, cancer-causing fiberglass, I can’t imagine why one would not want to use sheep’s wool instead. Plus, how can you resist the cuteness of these sheep? 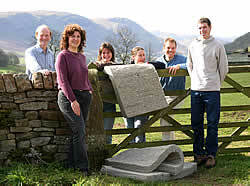 Thermafleece is made by an company called Second Nature, which is based in northern England. From the picture they appear to be a family?run farm business, which automatically gives them bonus points in my eyes. I wish we could all buy this stuff and support small farmers who are making use of a renewable, eco-friendly product. Unfortunately for Americans, Sheep’s wool doesn’t seem to be too easy to come by in the US. Thermafleece is only sold in the UK, and most of the companies producing sheep wool insulation seem to be either in the UK or in New Zealand (where sheeps abound). For North Americans, Canadian Good Sheperd is one company producing sheep’s wool insulation. * It is breathable and it can absorb moisture with no loss of thermal efficiency. This is one reason why it is so effective at keeping buildings warm in winter. * During warm conditions it releases moisture which actually helps with the cooling effect. * It is environmentally-friendly. Its production takes a fraction of the energy required to produce glass fibre insulation. * Unlike fiberglass insulation, it is completely safe to handle. For basements, attics and indoor wall insulation the Diggerslist is writing about the Sheep wool panels or WoolBoards, which are R4 per inch and up to R12. The rigid panels are used as final finish and then painted over. In Italy the wool and lime panels have been used for more than 15 years now because the lime in the panel is also reducing mold issues in humid and cold corners. Generally speaking panels applied on top of dry walls have the advantage, that the heat flow in the studs is minimized. How good is insulation of just the cavities, if the studs act like a thermal bridging? Who leaves windows and doors open even 1 inch, when same applies to the insulation. Also, insulation panels save on labor and materials compared to installing stud walls, batting and dry wall. Your site has a multitude of extraordinary content. Very informative. I would be happy to provide the latest information on wool, as a modern insulation material. How can I obtain sheepwool insulation here in the U.S.? I live in Houston, Texas and I'm remoldeling an older home. Do you have a USA distributer?? It is often new developments in technology that give rise to improvements in efficiency and environmental sustainability. Sometimes, however, the biggest innovations come from simply looking at old materials with new eyes. Case in point is Thermafleece - a patented sheep's wool insulation material for buildings. People have know for thousands of years that sheep's wool has excellent insulation qualities. We've been making garments out of wool for centuries, so why has no one thought to use sheep's wool in buildings until now? Given that the standard insulation choice is toxic, cancer-causing fiberglass, I can't imagine why one would not want to use sheep's wool instead. Plus, how can you resist the cuteness of these sheep?